I spent some time traveling around China in May, and have been involved in some e-learning work with the Chinese Government through the World Bank. What did I learn from all this? Well, it’s an amazing mix of contradictions. A people addicted to passive, non-critical, classroom learning but a rising generation addicted to mobiles and the internet. A culture still profoundly conformist and Confucian in education, yet dying to to break free from the past. With education all but destroyed during the Cultural Revolution, China is trying to use education to create its own future. Today 10.5 million Chiese sit the gaokao, the state entrance exam for Universities. Only 6 million will succeed. The cream of the crop are likely to be employed in government. This selection process has an ancient pedigree in China. Confucian education is nearly 2,500 years old and is based on hard work, compliance to the state, a focus on personal behaviour and competitive examinations. Confucian exams were take so seriously in the past that papers were kept locked up, examinees body searched, essays transcribed into identical calligraphy and read by at least two independent examiners. The penalty for abuse was death and exile for one’s family, and nepotism was avoided through quotas. In was an absolute meritocracy. One study showed that 83% of the top students were from lower-class families. Note that it wasn’t until the 18th ad 19th centuries that meritocratic examinations were introduced in Europe and the US. Although China has this Confucian continuity, in the second half of the 20th century, Maoism led to compulsory Marxist-Leninist ideological schooling then the horrors of the Cultural Revolution, encouraged by Mao, when school teachers and intellectuals were ridiculed, tortured and even murdered by their students. Their education system literally imploded. China today is really a Deng Xiapeng inspired, post-Mao society, where education has exploded from nothing to warp speed in 25 years. There are nearly as many people learning English in China, as speak English in the US, Canada and the UK combined. Learning Mandarin is pointless, better to learn other skills, while Chinese kids learn English. English is absolutely the language of choice in China. You see English schools and ads for English lessons everywhere, and the use of the internet for learning English is massive. Its cities are its economic dynamos and the Chinese salt away up to 40% of their income for their old age, education and support, exacerbated by the one child per family policy (apart from minorities). This draconian birth control policy means they are vociferous savers and invest a high proportion of their income specifically in the education of their children. These savings fuel the economy and pay for the financing of their own and even the US economy. They start at six/seven and have six years of primary education, followed by six in secondary up to the age of 18. But in terms of the curriculum, China is very different, with more focus on science, technology and vocational subjects, which have been mandated to drive economic progress. This has now widened out with increasing interest in the humanities. Schooling is long hours and often long journeys with absent parents working away from their home town. Everywhere in China you see groups of track-suited kids (school uniforms are colourful sportswear). Playgrounds often have large groups of students doing choreographed dance, singing patriotic songs and generally being drilled into a communal approach to progress. One lovely feature I saw, were children taking a daily nap after lunch. The Chinese have long recognized that children are in no mental state to learn in that post-prandial period. Behind all this is a recent, massive growth in the private sector in learning. Despite the appearance of uniformity and the desperate grind towards getting your child to University, there is plenty of variety in the system. A sign of this ambition is the fact that there are more Chinese students studying abroad than any other country. 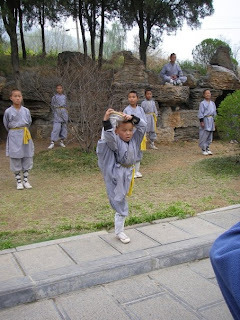 A visit to the Shaolin monastery in Central China, the acknowledged 5th century source for all martial arts, revealed a fascinating side of Chinese education. It was a unique occasion, as a big-wig was visiting, and this brought out the entire student population. This is the home of Zen Buddhism at the foot of a sacred mountain with a temple, founded in 496 AD. There are an amazing 160,000 students here, many in schools with up to 30,000 students, who receive a disciplined martial arts and academic education. Students are sent here by their parents from all over China. The aim is to give them some discipline, independence with the promise of good jobs in the police, military, security, even the movies. Shaolin was a mass of students, colour, movement and flags. There were students in mock fights, poses, even meditating in the woods. They were remarkably disciplined and happy, despite the cold wind that cut through their flimsy, silk outfits. I will never forget the sight of these tens of thousands of smiling students. It was especially thrilling as my sons are both experienced Tae Kwon Do students and instructors. Curiously, my first glimpse of sport in China was cricket, on the way from the airport. However, it was clear that the Chinese have a radically different tradition and approach to sport and exercise. Table tennis is everywhere but basketball is the sport they adore. Space is at a premium, so soccer fields are rare. Basketball is played in every school. Then there are the street gyms – free equipment in little parks for citizens to exercise. But this is nothing compared to the millions of older Chinese who get up at dawn and do Tai Chi and a myriad of other activities in their local park every morning. China wakes up, exercises and gets on with the job. They are clearly conscious of personal health, and obesity is very, very rare. Visit the Temple of Heaven, or any other public park, and you’ll witness the early morning activities – tai chi, swords, fans, a game where one keeps a feathered shuttlecock aloft with one’s feet, calligraphy using a large brush and water, singing, playing traditional music instruments, cards, mah-jong. Thousands of people taking exercise or simply having fun with their fellow citizens. It’s quite moving. A typical Western park at that time of the morning would be empty apart from a couple of dog walkers. Its social function is extraordinary as older people sit, chat, exercise, sing and walk their birds. This was a sort of small paradise, far different from parks in the west. In Luoyang I went for a walk in the Peony Park at 6.30 am. It was a riot of activity but all organised and at a pace to suit everyone. There was slow paced tai chi, ultra-slow tai chi, faster with swords, slower with pikes, mid-pace with scarves, the two large groups dressed in beautiful red and white silk suits exercising with fans which would all chop open at the same time producing a wonderful wooden snap sound. There were also modern dancers doing waltzes and the tango. One group were dancing in unison to Michael Jackson’s ‘Bad’ but in a slow and graceful fashion, in complete opposition to the lyrics, which I’m sure they didn’t understand. The there were the badminton players and people playing foot badminton. Big brush calligraphy was also on show. There was even a guy with a bullwhip and a spinning top. Several people came up to me and spoke in English. One an older man, had great English, another woman wanted me to meet her English teacher and they turned up at the hotel the next day. That was a quote from a Chinese youngster. Internet cafes are everywhere, some with hundreds of PCs, and full of youngsters escaping the lack of privacy and cramped conditions at home. PCs are expensive and this is a way of getting some social contact with one’s peers. News is HUGE, MSN is HUGE, game playing is HUGE. However, the government has been trying to close many of them down over the last couple of years. They’re seen as subversive. Internet use in China is now much bigger than the US and has a very different profile. China has restricted media and is a huge country with a huge population, so news and email are the two big uses. More than 220 million Chinese were on the internet in February 08, according to estimates from official Chinese statistics by Beijing-based research group BDA China. (Official Government statistics come out in July). With a growth rate of over 50% per annum, the numbers are mind-blowing. This compares to 216 million users at the end of 07, in the US. Of course the percentage of the population in the US on the internet is over 70%, compared to China’s 17%, but China has 1.3 billion people compared to the US’s 304 million. China is also the world leader in mobile telephone use. Mobiles are unbelievably common, and preferred to landlines. They have literally skipped a generation in telecoms. One curious cultural difference was the way the almost wholly Chinese audiences chat and answer mobiles during the whole performance, and even stand up in front of you before the performance is finished. The audience was awash with mobile phones being held aloft to video/photograph the action, blinding those in the row behind. The act of recording was clearly, to many, more important than enjoying the real performance. I’m told that cinemas are similarly plagued with people who cheerfully answer and chat into their phones during the entire movie. I’m told this also happens in India. With many tens of millions of bloggers, one would expect a lot of anti-government activity. However, a lot of bloggers are just as angry with the western media’s coverage of China, the Olympics and Tibet. No matter how may electronic fingers they insert into the wall to stop the leaks, the people and technology seems to be winning. A PC costs as little as £200 and the software is all pirated. I tried the usual Tibet, Tianamen and Taiwan searches but most were disabled. However, Wikipedia is available, with only sub-sections rendered inaccessible. Of course, other countries, such as Saudi Arabia, also control internet traffic. They have just one ISP which screens out un-Islamic sites. Chinese traffic is too large to police but it has four levels of filters and keyword identification. So Tibet, Taiwan, Tianamen, Falun Gong are pretty much kept outside of the wall. However, the Great Firewall is full of leaks and much traffic takes place between mobiles and using flash drives. It is not clear that the Confucian Chinese system of education, with its focus on passive, rote learning, leads to innovation. It seems to have produced a culture of copying and commoditisation. What all of this manufacturing and rush to modernity means is commoditisation. China is not an innovator. there was little in the way of things that was surprising, fresh or new. The same copied stuff appears everywhere. One yearns for creativity, rather than copying. I suspect this has a lot to do with the educational system, with its Confucian conformity. It was disappointing to see MacDonald’s, KFC and Starbucks in all major towns and cities. I hope the Chinese don’t fall for this commoditised, US version of western culture. Several recent commentators have looked at China’s long history of imitation, borrowing and copying. The scale of software pirating is immense, even at the corporate level and punishment is rare and irrelevant. Local officials are often involved in counterfeiting businesses and tourists lap it up. This creates an unfair commercial playing field. It also puts a break on ideas led innovation and entrepreneurialism as everyone knows that their ideas can be pinched and copied. This is a nation that broke all the rules to get here, they see this as a virtue. The bottom line here, is that this avoidance of law is, in fact, a massive global subsidy. The downside of rapacious capitalism, is that there are few great companies and problems with productivity, rampant counterfeiting, corruption, white elephant projects, risky bank loans and inflation. China was not a signatory of the Kyoto agreement and many of its huge cities sit beneath smog that blots out the sun for days on end. Desertification is eating away at productive agricultural land, water is polluted or in short supply, and air quality is appalling. This remains a problem for both China and the world. Economically, this is rampant capitalism, with few of the slowly evolved checks and balances of the West. Companies keep three sets of accounts, one for the bank, one for tax, one for management. Loans and bad debts may yet rebound if there’s a downturn or recession and the credit crunch in China could be mother of all crunches. The necessary lowering of expectations may also lead to political problems as there are huge funding issues around health, education and social security. China is 144th in the world on public health supply. Sorry if I’ve gone on a bit – just wanted to pass on my general impressions before they fade. Good you shared this travel blog. One thing that you miss is the cultural integrity. That is what keeps the traditional nations like China and India going. It's true that popllation has now become huge human resource asset but this can be true for the African countries too. What is happening there is strife and civil wars. So, what is it that is different? The difference is the submissive women here who become the focal point of the household. At the cost of their own survival they keep the 'homes' intact. This sounds silly but remember the family is the building block of the society and subsequently the nation. Every thing adds up. I have seen women who will have just one dress to wear and will save and hunger to buy books for the kids. There are women who are abused physically, mentally and just drag through life, just so that their children do not suffer and are in a stable environment for their education. I do not endorse this but this is the root cause why there is so much'development'.This is the reason why today Cinese population is not into drug abuse like it was, centuries ago. It is not hunger that drives the population but the environment they inbibe while growing up. Wesh has prospered, and I am not being judgemental here, it has also veered towards individualistic culture. It is easy to abandon children and start an'exciting' life who would not love it? But it takes a steely resolve to stick around and be responsible. Here is the secret why these economies have become a threat or it could have been another nation with population drunk and opressed but with no will to work or betterment. Dont know but felt you had missed this relevant point as economies are in someway connected to ulture too. This should be in a book, it will be a sure sucess. Awesome! (To imatate the Yankees! How should I thank you. For days I have been looking for place to donate for Mayanmar today through your earlier post on rice donation I got it. God bless and regards.BTW I just finished reading all the arcived posts in this blog and the arts and the travel one. Recession has some benefits seems! In Canada, we have a similar phenomenon on a smaller scale. Nearly all French people learn English, so English people tend not to see the need to learn French. Consequently, only 7 percent of English canadians speak French. This creates a tremendous advantage for the French, so much so it is noticable (and complained about to no end by the English). French people are qualified for government and service jobs because they speak both languages - and you *have* to speak both languages because there's *enough* people who hold on to French as their primary language. The same thing will happen on a global scale. People who speak both languages will have an advantage. An increasing number of positions will be filled by people who speak English and Mandarin. Unilingual North Americans, who falsely believed that everyone would adapt to them, will be left out and resentful. I'm not against learning a second language. In a country like Canada with two large liguistic groups and even the US, with its huge number of spanish spekers, there's a clear rationale for learning the other language. There's loads of oethre examples within coutries such as Basque and Spanish, Welsh and English etc. Even here, however, one finds that as a matter of convenience, one langiage tends to dominate. Even in the in European Community, conferences tend to be held in English. It is simply a matter of convenience. When it comes to 'business', the world, ad the Chinese have made a choice. English it is. I am old enough to remember the exhortations by government to learn Japanese. I'm not sure that 'business' should be the driver here, especially since there is concensus around English being the official language in the airline industry, medicine and so on. Id add another difficulty. Mandari is fiendishly difficult to learn, not only to speak but to write! Unlikely. (true in past and ancient times, though) The best of the students do not end up in governmental systems which are commonly considered routine and restrictive. It is more likely that some average guys that want a stable, well-paid, not harshly competitive job that go for the public service career. Of course those with promising social relations or political ambitions go for it, too. In more privileged colleges students are significantly market-orientated. True. But bookish education doesn't dimish innovation either. The apparent lack of innovation and passive learning style are more from the monstrous pressure of competition. Traditionally the low level of material support (and sometimes ideology) suppresses divergent education styles but it is encouraging that the ecomony boost now changes the primary/middle school education visibly, compared to my own school time.